We are a family of 5 (while our godson is living with us) living in an off-grid camping trailer while we build our house. And we ripped the shower and toilet out of the trailer long before we ever started living in it. However, in reality, we all take fewer full showers than most people do. Being that we have to haul in our own water, we try to conserve as much as possible. The girls and I only wash our hair once a week, and the water always gets turned off while soaping up. And in between those several full showers a week are the “rinse offs”. This is where we basically only wash off the truly stinky parts. You know, those areas you’d hit with a quick sponge bath. When we lived here two years ago for those few idyllic months, we mainly took sponge baths and went to my mom’s house when a full shower was needed. But we knew that couldn’t last for too long, so when we moved back to the homestead this summer, we knew we needed something more permanent. And yes, there’s always Pajii’s trailer, but we don’t want to constantly be using his water and power or crowding his space every time we need to clean up. Not to mention how tiny those trailer showers are! So Hubby built us a shower room constructed from 2×4’s and plywood. 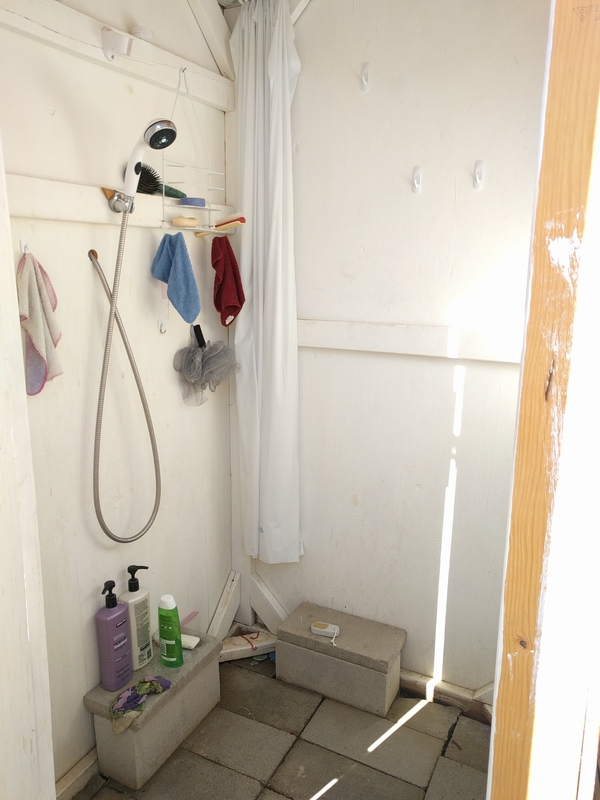 This 4×4 mini-shed makes a very spacious and wonderful shower. 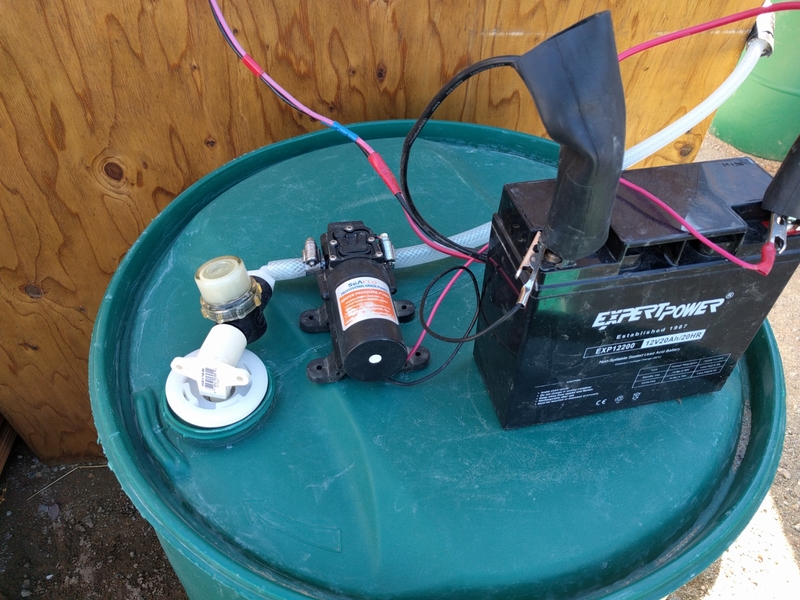 We use a 20 amp hour, 12 volt battery connected to an RV water pump which sits on top of one of our 50 gallon barrels of water. 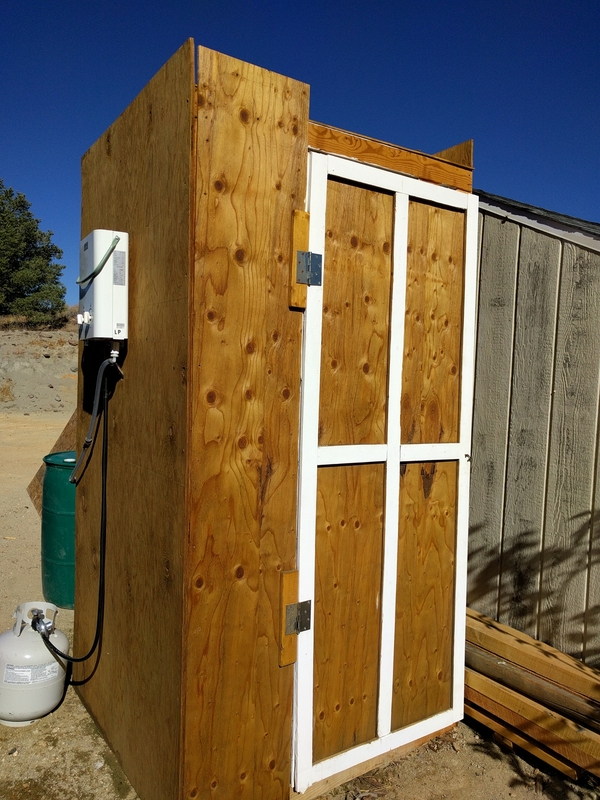 A 100 watt solar panel is hooked to the battery to keep it topped up. 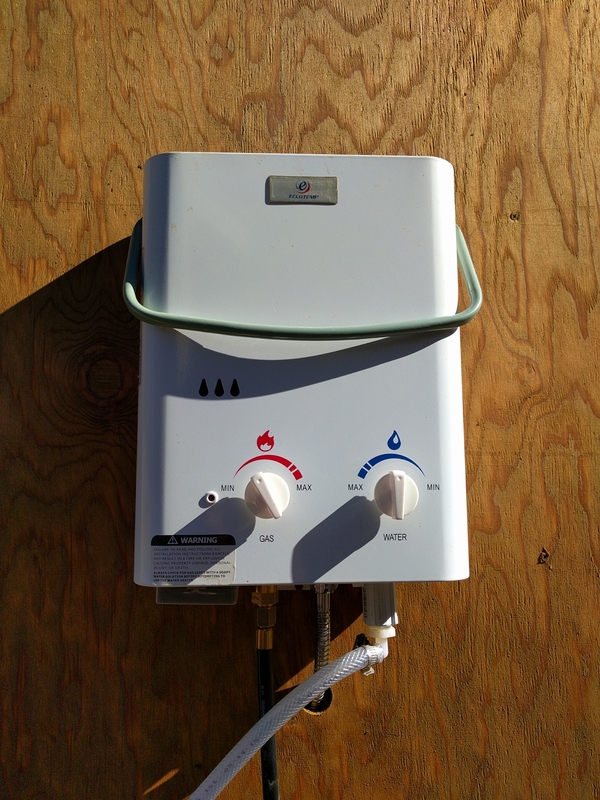 The pump brings water through a propane powered instant hot water heater. Right now, we only have the ability to turn the water on and off while inside the shower, not adjust the temperature. So showering can be quite the adventure depending on how warm the ambient air is as well as how warm the water inside the barrel has gotten. If you’re taking a shower mid-afternoon on a warm day, you’d better turn that puppy waaaay down before you get in there. 😀 We have plans to rig it up so we can adjust the temperature from inside. But we’ve had a few, more pressing projects. The reason we have a shower curtain in there is so we can hang our clothes and towel on the hooks and close the curtain around them so they don’t get wet. There is no floor built into the shower. 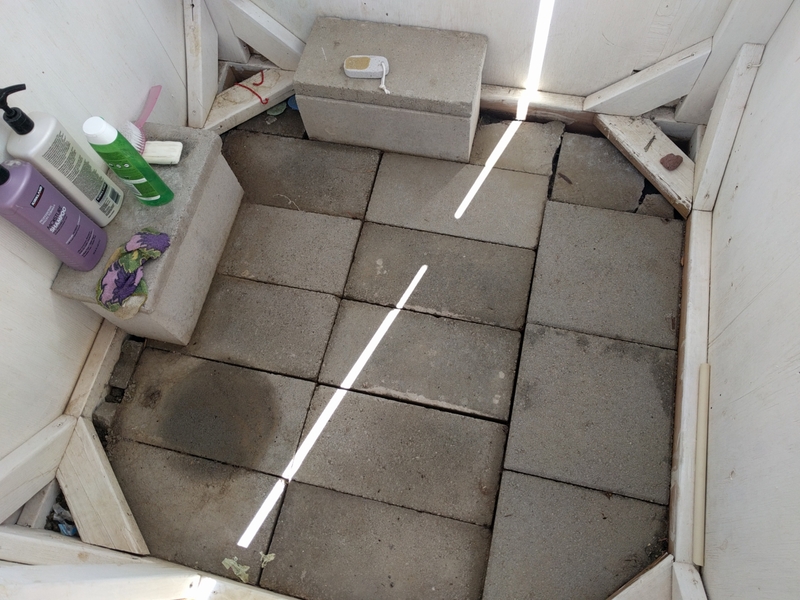 Rather, we placed pavers on the ground inside so the water can drain easily. So far, the whole system has worked almost seamlessly. Once the temps drop, we will need to do something to keep things from freezing, but for now, and probably at least another month or so, we’ll be fine. But it will happen when it happens. There’s nothing we can do about it, so why stress over it? God has his reasons. In the mean time, we’re keeping busy. So anyway, now you know how we get clean here on the homestead. 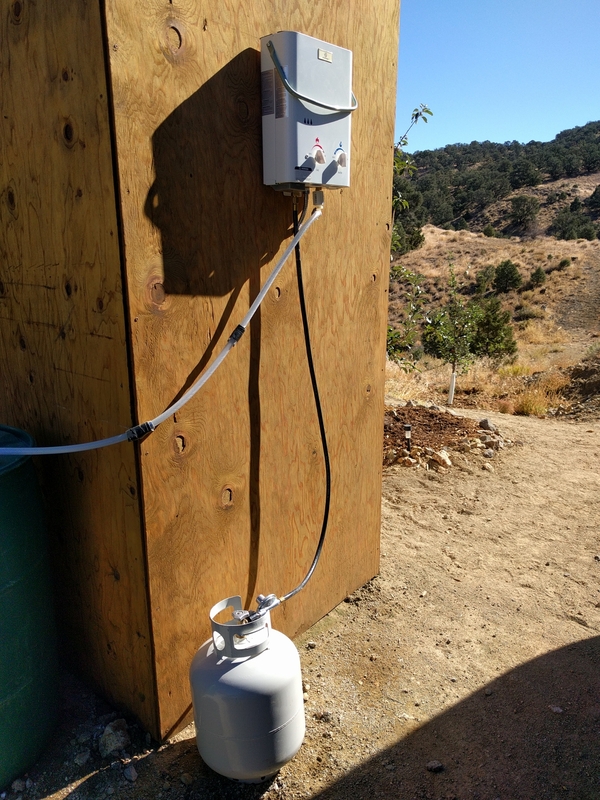 This entry was posted in DIY, Trailer Living and tagged Building, Construction, DIY, Homestead, Homesteading, Off Grid, skills, Trailer Living on September 28, 2016 by Maridy. Brilliant! I especially like the shower curtain idea – to keep things dry. Once you get your well up and running, I’m sure those hot showers in the winter and cooler showers in the summer will be very much appreciated!